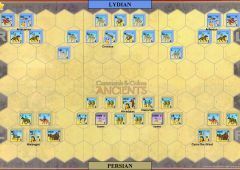 After conquering and consolidating much of the “civilized” world for the preceding three decades, Cyrus the Great cast his imperial glaze in 529 BCE towards the Massagetai, a semi-nomadic desert-dwelling culture living in the region east of the Caspian Sea. 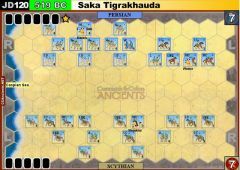 After Queen Tomyris of the Massagetai declined the offer of marriage from Cyrus, the Persian army moved to the Araxes (Jaxartes or Syr Darya) River to settle the matter by force. 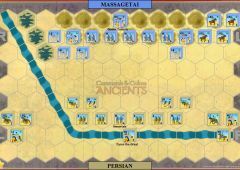 Like many Persian battles of the era, this one has many semi-legendary qualities as recorded by the ancient historians, including the decision of Cyrus to sacrifice the “expendable” parts of his army in order to ambush a larger Massagetai force. This in turn enraged Queen Tomyris, who felt her offer of an honorable battle had been ignored by Cyrus, and whose son Spargapises elected to commit suicide rather than be ransomed back by the victorious Persians. 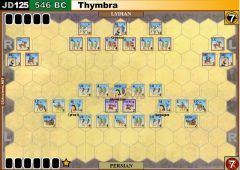 Tomyris then “collected all the forces of her kingdom, and gave him battle”, likely outnumbering the invading Persian army. According to Herodotus, the Massagetai fought “both on horseback and on foot, neither method is strange to them: they use bows and lances, but their favorite weapon is the battle-axe.” The battle likely opened with a furious exchange of archery fire, and then progressed into a vicious hand-to-hand battle, described as the “fiercest” in the ancient world by Herodotus. 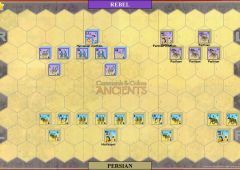 The Persians were eventually defeated by the combination of heavy cavalry, axe-wielding infantry, and both foot and mounted archers. 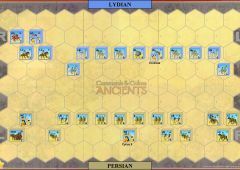 There was even some ancient speculation that the infuriated Tomyris ordered her best archers to specifically target Cyrus, who himself fell on the battlefield. 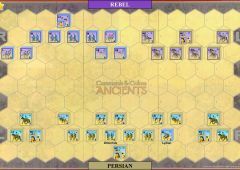 The impressive reign of Cyrus the Great was now over, and his successors Cambyses II, Darius I, and Xerxes would soon take the Persian Empire to even greater heights. 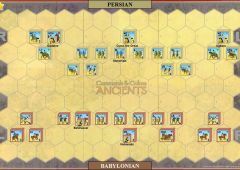 The political and military legacy of Cyrus would live on, despite his ignominious death on a distant battlefield. All river hexes are fordable. 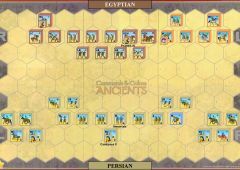 Targeting Cyrus: According to legend, the enraged Queen Tomyris gave specific orders to her best archers to target Cyrus the Great on the battlefield. Accordingly, any time that a Massagetai archer unit (either foot or mounted) fires upon any unit that Cyrus is commanding, a 2d leader check is rolled REGARDLESS of whether the unit took losses during the range attack. 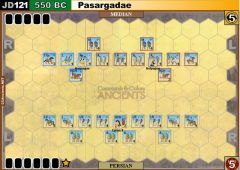 If Cyrus the Great is eliminated, the game is ruled an automatic victory for the Massagetai; if Cyrus evades off the board, the game continues. Persian Immortals: The Immortals unit is considered bow-armed (in addition to their normal medium infantry capabilities), and may ignore one additional flag.